I feel the most loved when I feel noticed. When someone wants to know how I'm doing, asks me again until I tell them. I feel the most loved when I feel appreciated. I really do try and do things for other people and I know I should do it just for the giving, but sometimes I feel like I give and I give and no one even cares. So why bother anymore? Perhaps that also has something to do with little boys who have to be taught to say thank you. But they show their thanks and appreciation in other ways. Snuggles and kisses and wanting to share everything that's going on with me. I feel the most loved when you reach out and touch me. Some days I am sick of touch (see above and little boys), but it's a different kind. A hand on the arm, a hug even. I feel the most loved when someone is taking care of me, as has been the case this week. Brian staying home to take care of the boys and me when I could hardly get out of bed. I don't often know how to ask so many outside my home probably don't know how to do this, but he does. Sometimes a mom needs to be taken care of too, and not just when she's sick. 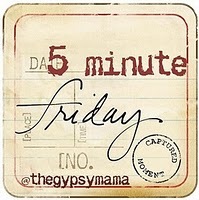 This is a post prompt from The Gypsy Mama. Won't you join in? Yes, mine was rather different from yours. Different in general tho too. :-P I liked your answer. I agree with what you said about someone asking how you are doing and then keep asking until you actually tell them. I don't know Gretchen, but I used to get HopeChest, which Natalie Nyquist wrote for, which connected me then to ylcf.org, which connected me with Gretchen. :-P That's neat about knowing his family! Beautiful words! I love seeing how different people can write answering the same question yet come up with so many different answers. It shows me your personality, a hint of who you are. Once again, these words you formed are lovely! I completely understand the touch part. After being touched by children all day, some days I have to remember to remain open to my husbands touch. Visiting you via 5 min Fridays. I know...when you give all of the time, it is such a treat to be given to, and none other than by our sweet companions, husbands. Love. Stopping by from 5 minute Fridays. There are seasons of life. When I was breastfeeding my children there were times that I didn't want to be touched mixed in with times that I desperately wanted a hug. Sometimes my husband was confused. Blessings to you today--hope you are feeling better! Thank you for sharing. You put how you feel loved so well. I really understand feeling love when someone notices you and asks how you are doing. I also join in on 5 minute Friday today. I thought this was a great way to share on my blog today. I hear you on everything, but especially the words of gratitude! Moms do so much, all day long, and kids don't always know how to express thanks, so it's *really* nice when a grown-up notices something you do and THANKS YOU! Daughter, I'm sending you lots of hugs. You are loved!